Why is it that on Halloween girls suddenly throw all their dignity out of the window and wear the most sluttiest of ‘costumes’ – no matter if they are a curvy size 10 or a obese size 20. It totally boggles my mind – the same girls will slag off everyone on Snog, Marry, Avoid throughout the year but then on the 31st of October they are even worse. Anyways rant OVER, I hope everyone had a great Halloween – I had loads of fun trick n treating with my BFF and her family – it was really lovely plus I got to eat hotdogs (not octopus :-P) and loads of sweets! 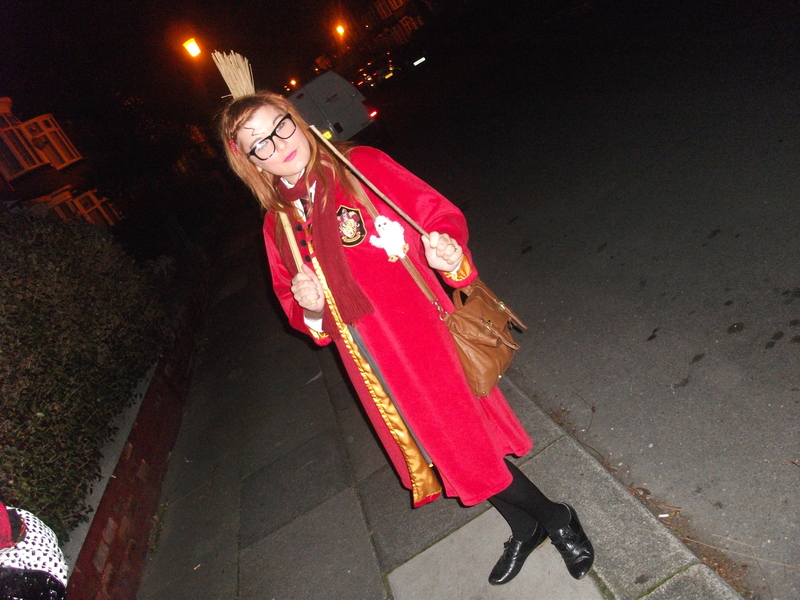 I decided to dress as Harry(iet) Potter – complete with Hedwig and a Nimbus 2000. Scar: free – eyliner special from my make-up bag. Scarf: free – found it in my house. Gryffindor Tie: £2.99 – eBay. Gryffindor Robe: £10 – Charity shop – BEST BUY EVER! Grey Skirt: £1 – Charity Shop. Hedwig: free – Burger King kids meal. Wand: free – Cara broke off a bit off bamboo for me from SU. Nimbus 2000: free – Liesey borrowed me it. I should totally be studying Care of Magical Creatures Hogwarts and not Journalism at Teesside University.